Home / Posts / GraceWorks / Lemonade Anyone? I am a nervous hostess. I enjoy people and spending time with them, but if it is at my home I fret a great deal about my “performance”. Is the house clean? What should I serve? Where will we sit? How can I make my guests comfortable? My anxiety is similar to the anxiety felt by actors and stagehands just before the curtain goes up. I work hard to make everything perfect and then hold my breath until “the curtain comes up” that is, my guests arrive. Canada just hosted the world for the Winter Olympic games. And the curtain came up at the opening ceremonies, which are a big deal for the host country. This is a chance to showcase your nation’s unique and distinct personality. There is the parade of athletes. And then, there is the lighting of the Olympic flame. A flame that was sparked on Mount Olympus and carried across the world. It is a high honor to carry the torch. And each host country determines how they will display the flame. Canada came up with a very artistic sculpture. A central torch with four pillars slanting toward it. The four pillars would rise out of the floor and reach up to the central torch. Four Canadians would each light one pillar and the flames would travel up the pillars to the central torch. I say, cue the pillars. Nothing. There was a very long pause as the world watched. Four torch bearers waited. This is not how it was rehearsed. Wayne Gretzky later would say he knew something was wrong when he heard someone yell, Can’t you crank it up? One of the pillars malfunctioned. It would not rise. The world waited. It was time to move on. Three pillars rose out of the floor. Three torch bearers lit the pillars. Three flames rose to the central torch. One torch bearer stood with nothing to do. How embarrassing! All the plans and preparation, and it failed. It failed. In front of the WHOLE WORLD. How would you handle this kind of incident? I would consider it mortifying. Disappointing! All that hard work ruined because it didn’t come off perfectly! But Canada had another response, one that showcased the nation’s distinct personality. For the closing ceremonies the pillars and torch would again be center stage. Undoubtedly by now the malfunctioning machinery has been repaired. Did Canada hope no one remembered the failed torch lighting? No, Canada chose to draw attention to the failed pillar by sending out a clown. A clown dressed in handyman’s clothes. This clown fussed around the “broken” pillar and discovered two over sized electric cords. He made a very big show of plugging the one into the other and, Voila! The pillar came up! And up went my admiration and respect for our neighbor to the north. In front of the whole world Canada showed it could laugh at itself. And they invited us to laugh with them. 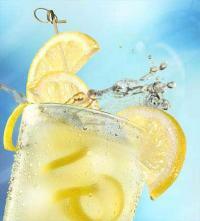 What a great batch of lemonade!